Active sports on the way to the Grand Canyon. Most visitors only spend a night in Flagstaff on the way to the Grand Canyon, but this gateway city has plenty of its own less-hyped but great spots for hiking and skiing. Lace up your hiking books for an excursion into the nearly two-million-acre Coconino National Forest, or, during the winter, hit the slopes at the Arizona Snowbowl, which has the state’s largest drop (at 2,300 feet), just seven miles north. For some easy rambles through forested hills on the outskirts of town, grab a map of the Flagstaff Urban Trails System (FUTS) from the city visitor center. 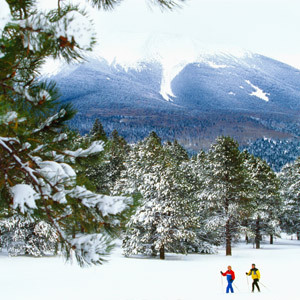 Attempt the challenging, nine-mile round-trip Humphreys Peak Trail in Coconino National Forest, which ascends to 12,633 feet from the Arizona Snowbowl winter ski area. The ski mountain boasts the largest vertical ski drop in Arizona (2,300 feet). The sophisticated fare at Brix Restaurant & Wine Bar—known for its superb wine list—includes dishes like crispy duck breast with a tart-cherry gastrique and pork chops with apple-bourbon jus. This 1894 rambling Craftsman-style house on the edge of Flagstaff’s lively downtown has 9 antiques-filled rooms each with its own fireplace. Try the “Southwest” room, which has a kiva-style fireplace.